I hope you all had a very blessed Thanksgiving! Oh how I enjoy taking a break from the usual grind to spend time with family and friends, eating and recognizing the many, many things we have to be thankful for. Is it just me or is it tough to “get the train rolling” again after such a glorious holiday? Anyway, although the caboose seems to be running a little slow this week, 😉 I’m back on the tracks again, so I wanted to share a bit of progress on the white house. 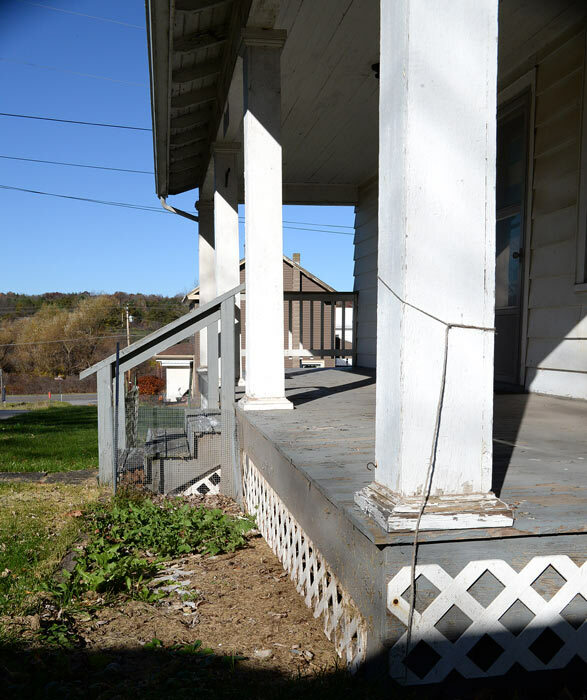 The front porch is this.close to being completely done. 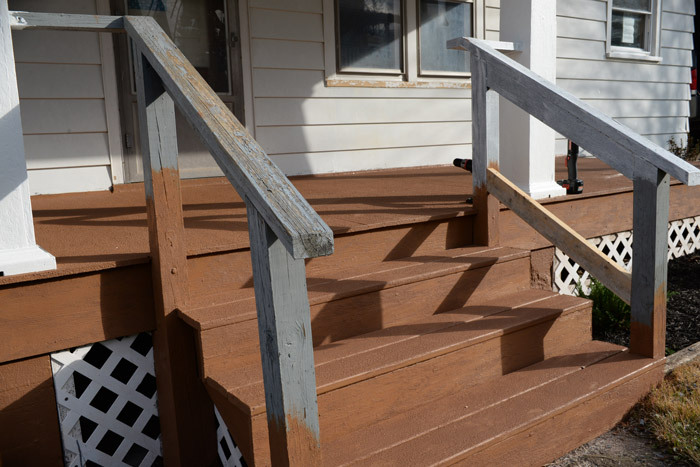 I’ve got to do a little bit of touch-up painting on the stairs and some staging to do. And I’ll be installing a new front door (new windows and trim are coming later as separate projects). Then this tiny part of the huge project will be wrapped up. Let’s rewind a few weeks, shall we? I did a bit of thrifty landscaping out front. 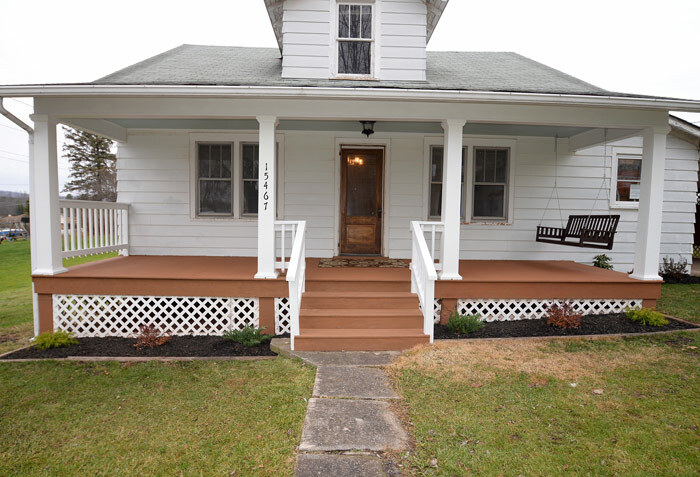 Then I painted the porch posts, porch trim and floor. 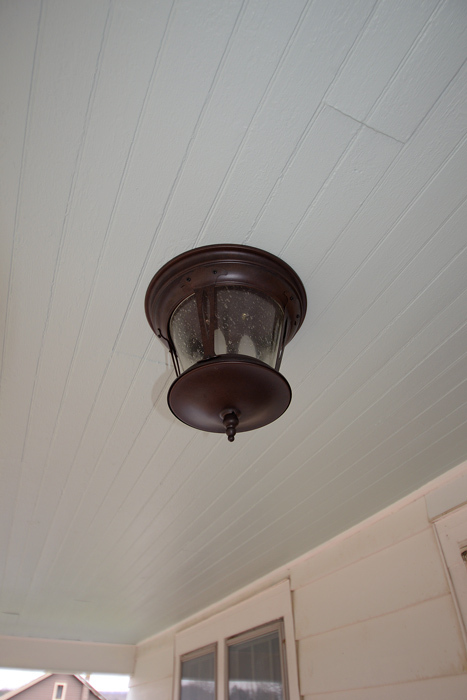 I am absolutely in love with the color I chose for the porch ceiling. I decided on a “haint blue” color I was inspired by while living in South Carolina. 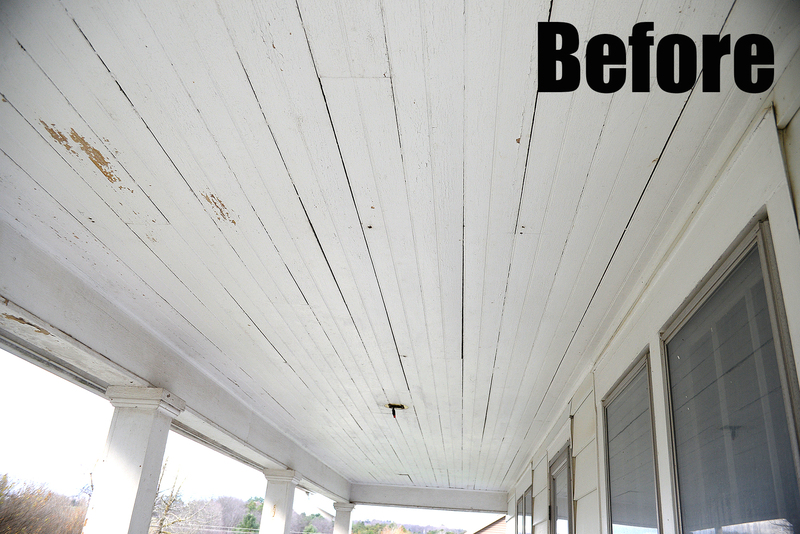 There, you’ll find many gorgeous, historic Southern front porches with this blue-green hue on the ceiling. Haint blue has a rich history you can read about here. I went with a fairly subtle blue so as not to scare all the Northerners away. 😉 I chose Clark+Kensington brand from Ace. 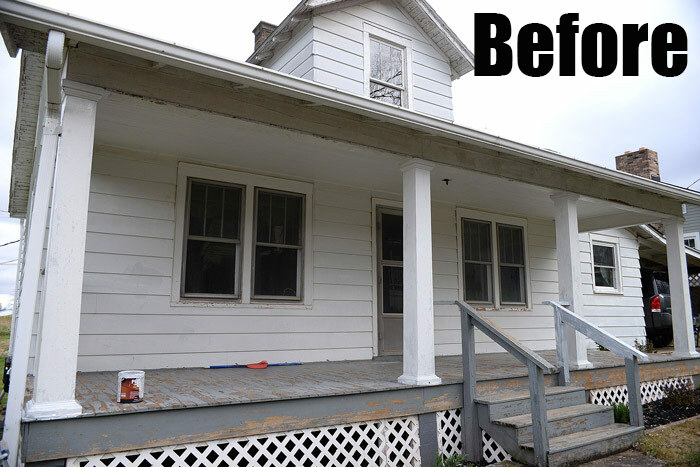 I’ve had good success with their exterior paint in the past. 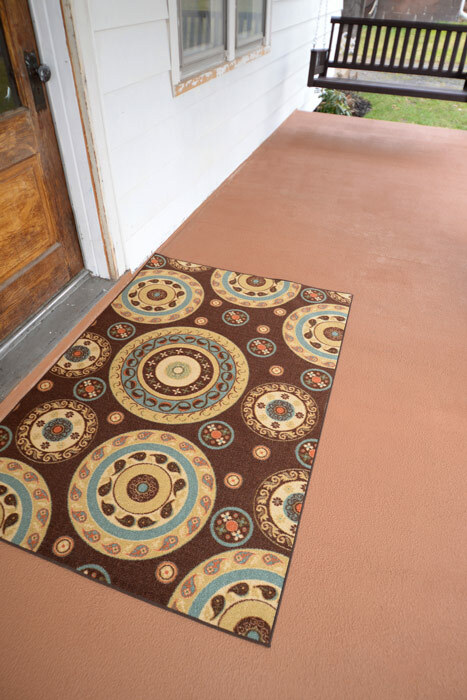 I picked up an inexpensive porch rug at Ross to tie together the new ceiling and floor colors. 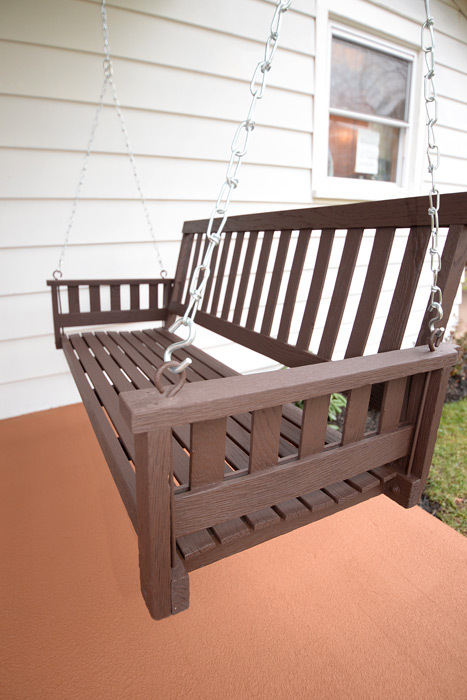 I spray-painted the old porch swing a rich mahogany color. My HomeRight® Finish Max Pro painted this thing in a snap and created such a flawless finish, the wood almost looks like it’s composite! I LOVE how it turned out. *Affiliate links are provided in this post for your convenience. 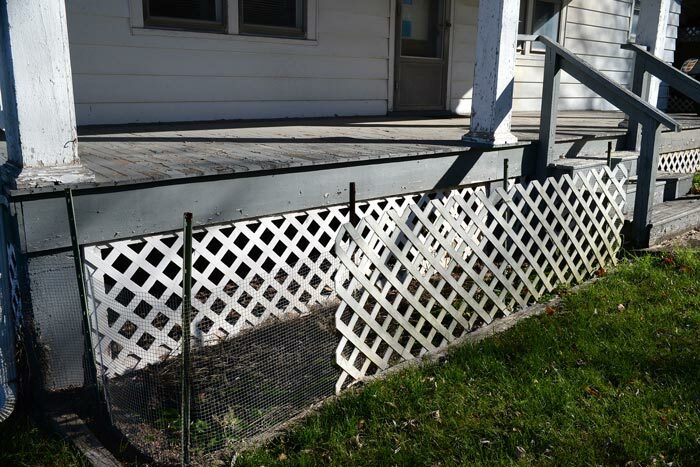 This entry was posted in Exterior, Flips and tagged Flip house, Follow this Flip, HomeRight, Rust-Oleum by Susan. Bookmark the permalink. 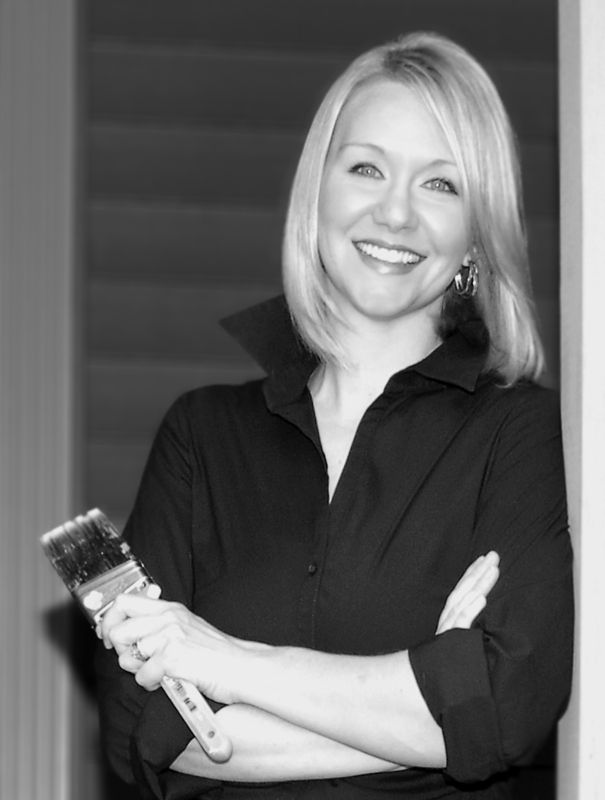 Susan, you are such a hard worker…you inspire me! Oh my gosh! That porch is rocking!!! If it where summer, I’d be sitting out there drinking my sweet tea! Awesome job. Thank you so very much for your kind words, Dawn Rene. They mean the world to me. Oh girl I do know what you are going through, and on top of everything there is nothing plum or square in an old house, lots and lots of work. I just don’t think I could do it again, but you are young, strong and very good at what you do and have such a good work ethic. I can’t wait to see it completed. Sister……this looks AMAZING! God has truly blessed you my sweet friend! Aw thanks, Michelle. Your kind words mean so much! When I get this house done, I definitely want to have an open house (with snacks, of course) and invite you guys to check it out. Love ya!